If you have a photo that has colors you want to add to your Color Swatches in Photoshop Elements 11, you can sample colors in an open image. Click the Eyedropper tool and click anywhere on a photo in the Image window, and the Eyedropper samples the color. This technique is called lifting color, although the color isn’t removed from the photo. (It merely replaces the current foreground color.) If you want to replace the background color, press the Alt key (Option on the Mac) and click the Eyedropper tool on a color you want to sample. In the Options panel, you find a few settings for the Eyedropper tool. Click the Eyedropper tool in the Tools panel and click one of the three choices in the Options panel. Point Sample: This selection is the default. 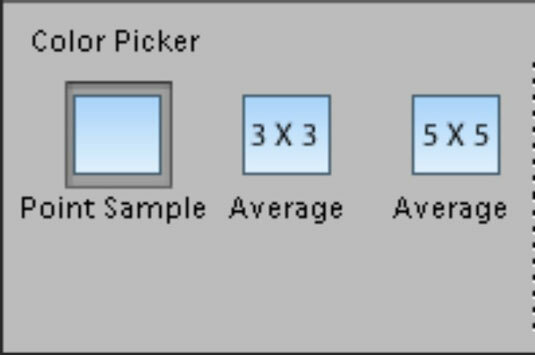 When you click the Eyedropper tool to sample color, the pixel you click is the sampled color. 3 by 3 Average: This menu choice averages 3 x 3 pixels, and the sampled color is the result of combining the color at the sample point with 8 surrounding colors. 5 by 5 Average: This menu choice averages 5 x 5 pixels, and the sampled color is the result of combining the color at the sample point with 24 surrounding colors. Just as you add colors from the Foreground Color Swatch to a Color Swatches library, you can sample colors in a photo and use the sampled colors to create a custom Color Swatch library.